I'm an advertising photographer/videographer based in Los Angeles, California. My mission is to create striking advertising photography, corporate photography and editorial photography of people for major advertising agencies, fortune 500 corporations and major magazines. I shoot photography and video assignments throughout California including Los Angeles, San Francisco, San Diego as well as the rest of the world. As a photo educator I am happy to share my unique vision and methods. I'm currently teaching classes at College of the Canyons in video production for professional photographers and photography students. I give workshops, seminars and lectures on short form video production at colleges, organizations and conferences around the world. As an advertising and editorial photographer and videographer in Los Angeles that often shoots on location I’m always on the look out for equipment that both adds production value and is lightweight. Very few pieces of equipment add the production value that Dollies do. Moving the camera smoothly even a short distance will enhance your shots tremendously. 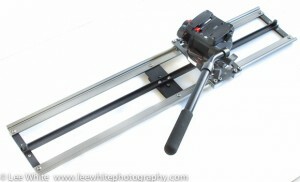 For years I asked around at different conventions and expos if anyone had a rail system two to three feet long that I could make into a short dolly especially that I could mount on a tripod. Everyone thought it was an interesting idea but no one that anything useable then all of a sudden, they were everywhere. There some made of skateboard,wheels while other run on rails or rods. I particularly like the ones from Indisystems. Tim Ovel of Indisystems first developed the IndiSLIDERmini and IndiSLIDERpro rail system. 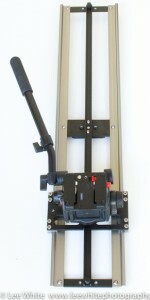 The mini is a small and inexpensive slider that you could fit into stand bag and set up quickly. It takes some practice but you can get decent results with lightweight cameras especially at the amazing price of only $99. 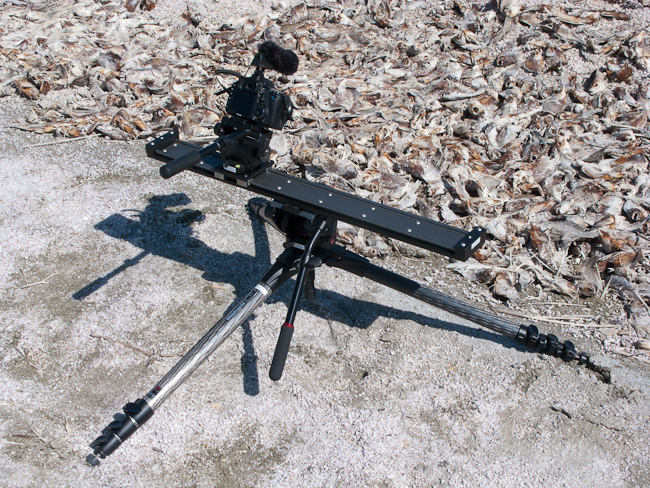 The Pro is a heavier weight rail that easily mounts a fluid head with heavier cameras. Both can be mounted on tripods or optional legs. I like mounting either on a sticks like the Manfrotto MPRO 536 with a bowl and half ball for leveling. Now to the sneak peak. I recently got a new lighter weight full size IndiSLIDERpro. Rather than a solid metal base the rails are held in place with crossbars and reinforced with a center strip. This makes the system very light weight but rigid while still having widely spaced rails for stability. The short video move below was shot recently in Death Valley at Bad Water with IndiSLIDERpro lightweight and a 7D with Zeiss 28mm Distagon ZE lens. Bad Water is the lowest, driest, and hottest locations in North America. See the views below with the slider with a Manfrotto 503HDV fluid head on the head plate. For more information on the full line of IndiSLIDERs go to http://www.indisystem.com. Secrets of video for photographers Friday seminar in New Jersey is more timely than ever for you if you want to have the skills most in demand today. Saturday workshop info below. Learn how to make videos that people want to watch. Whether you’re an amateur or professional, learn the techniques that every photographer shooting video should know even if you never take your camera off automatic. Translate your photographic knowledge in to cinematic genius. What equipment do you need and when do you need it. Come and get inspired as well as educated. – The latest in video equipment and software for video suitable for photographers getting into video. Secrets of video for photographers workshop in Atlanta on Saturday gives you a quick and thorough education in the tools and techniques every photographer should have when doing video. Whether you are a beginning, advanced or professional photographer, you can advance your visual storytelling with video in exciting new ways. Don’t miss this opportunity to hit the ground running in your adventure into video. Come join Lee White, professional photographer/videographer and college instructor as he guides you through the tools and techniques needed to help you make video without pulling your hair out. Avoid the common mistakes that ruin most novice videography. Learn what camera settings on your HDSLR for video mean and how best to set your camera for different situations. Find out how to do good audio recordings. See what video gear can help you make better videos. Find out what is involved with editing your video, adding music and getting it out for others to enjoy. Sponsors Panasonic, AJA, Apple, Manfrotto, Zeiss, Sennheiser, Smartsound, Redrock Micro, ManhattanLCD, Beachtek, Indisystems, Chimera, G-Technology, AntonBauer, Red Giant Software, Hoodman, and K-Tek. The indiSLIDERpro is a great video solution when you are on location and need a short dolly or truck move to tell the story in an more interested way. In the pictures below you see the IndiSLIDERpro mounted on the sturdy set of Manfrotto Pro 536 sticks. The indiSLIDERpro matched up with a Manfrotto 501, 503 or 504 fluid head make a versatile unit adding tremulous production value you your shoot. Even short dolly shots make for a more active viewing experience for the audience. Rather than be limited to pivots shots like panning and tilting, you can smoothly move the camera around in the scene. If you watch closely many dolly shots are short so the two or three foot slider is perfect. You don’t need the extra time and crew needed to set up and level a full size dolly with track. I can set up and level the indiSLIDERpro in just minutes so I’m ready to shoot. 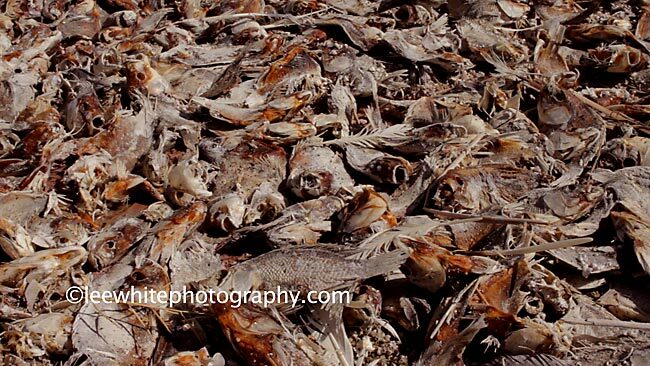 Here is a short move I made over the tons of dead fish along the Salton Sea. Go to www.indisystem.com for more information. The Salton Sea is 200+ feet below actual sea level so is the drainage for the surrounding area. Unfortunately this means all the pollution from the neighboring towns, golf courses and farm fields flow into the Salton Sea killing thousand of fish that cover the sea’s shore certain times of the year. What looks like white sand along the shore is the bleached vertebrae of fish. While the indiSLIDERpro is strong enough to hold full size video camera, it is still light and compact so one person can easily use it on location. The rails are mounted to a solid metal base that prevents the rails from bowing even with heavy camera gear so you will not out grow the system as you add more professional equipment like follow focus and an external monitor. 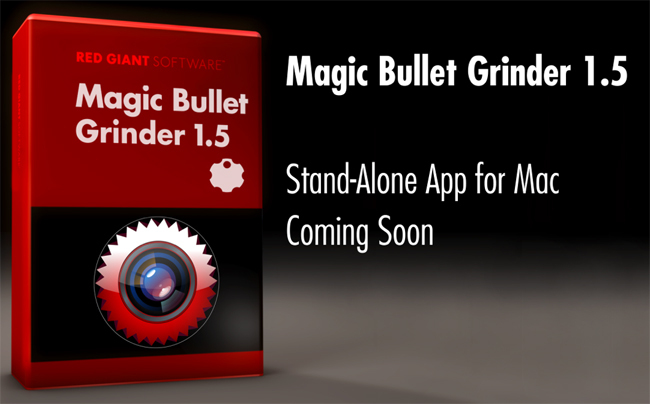 Lee White Photography used Red Giant’s Magic Bullet Grinder to transcode the original DSLR files into edit friendly PRO RES files for editing. The Manfrotto 536 MPro is the tripod (sticks) I use along with the 504HD fluid head when I want a solid base. I’m reminded all the time the lighter the camera, the heavier and sturdier the base needs to be. Driving to the Salton Sea for a photo trip, I stopped to shoot in the very windy San Gorgonio Wind Farm Pass. This is where there are wind farms with the large propeller-driven turbines and for good reason. 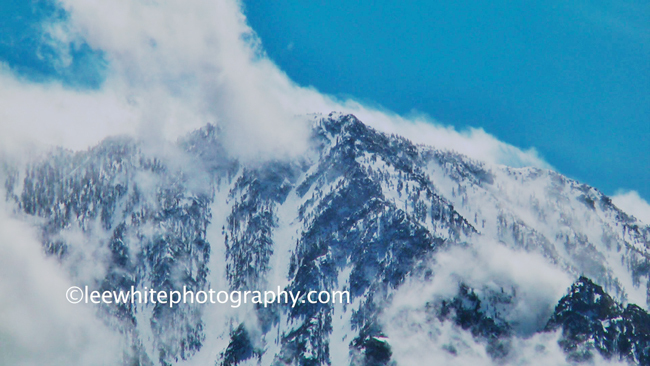 When I stopped to shoot the clouds passing the mountain top you see in the clip below, I was almost knocked off my feet by the windy gusts. There would have been no way a light tripod with the very lightweight Panasonic HMC-40 would have ever been stable. Yes, I could sand bag a lighter tripod but dragging along sand bags to weigh down a light tripod seems counter productive. Why not start out with a sturdy tripod and eliminate the hassle of sand bags. In video, you’ll often be applying forces on the tripod as you pivot the fluid head that you do not encounter in still photography. To pivot the fluid head successfully, you will want a fluid head that you can adjust the drag to just the right amount so you can more easily smoothly pivot the camera. The New Manfrotto 504HD head has tension adjustments for both pan and tilt plus an adjustable counter balance to deal with different weight cameras. A great thing about matching the 504HD head with the 536 MPRO tripod is the heights that they can be set at. The 536 MPRO can go from just inches off the ground to 80 inches which means I can get the angle no matter what. Plus you have either a 75 or 100mm bowl for the head to set into. In the picture below, I’m using the 536 MPRO at the wide leg setting, to support the indiSLIDERpro, a professional duty slider with camera using a Zeiss 28mm/f2 DLSR lens and Sennheiser MKE 400 microphone to capture a CU along the shore of the Salton Sea. A quick word about fluid heads. The Manfrotto 501, 503HDV and 504HD are great fluid heads that have all the adjustments you need for silky smooth moves. There are very few times that you will not want the option of at least pivoting the camera and a fluid head is the answer. Being able to finely tune the tension of the head helps you adjust for the weight of the camera gear and speed of the pivot. "Secrets of Video Production for Photographers"
College of the Canyons - Photo 177 Video Capture for Still Photographers. A innovative class where students learn to shoot still images and video to complete projects. This class gives the still photographer the skillset to add narrative motion to projects. College of the Canyons - Photo 280 Large Format Photography and the Zone System. A unique large format class where students will shoot 4x5 film using view cameras and the zone system. They will then develop and enlarge the film for assigned projects. Panel discussion for Brooks, Institute of Photography.